TO RURAL LIFESTYLE DEALER MAGAZINE TODAY! It's simple. Just complete and submit the form below. This is your opportunity to start to receive a FREE 1-year subscription to Rural Lifestyle Dealer. All we ask is that you provide us with some basic information about yourself and if you qualify you’ll receive all 4 issues throughout the coming year. All questions must be answered to process your FREE subscription. 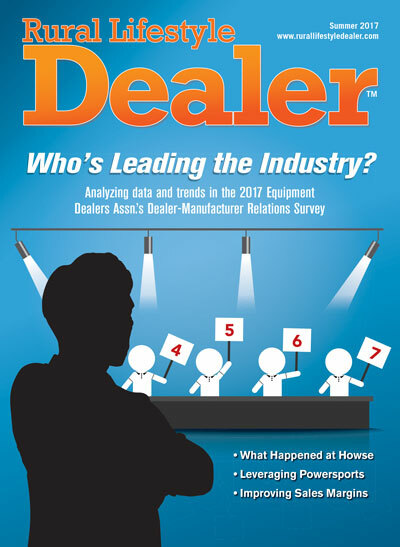 Streamline Your Operation — From parts and service, sales, to HR/management, you’ll increase profitability by learning top methods and practices from other rural equipment dealers. You'll find information on innovative outreach tactics, effective customer service programs and more. Business Trends & Outlooks — Get a leg up on the competition by learning of emerging business trends and how they impact the industry. You'll find insightful information on industry forecasts, revenue potential, and segment growth. Industry News & Trends — Coverage of what’s next on the horizon, and how developing trends impact your business.Find out new product opportunities for the rural lifestyle market, and much more!